Worse than expected earnings from Apple and Amazon were weighing on markets Friday ahead of the first estimate for third-quarter U.S. economic growth. Both firms reported losses after the market close on Thursday, contributing to a sour trading session in Asia. via Apple disappointment weighs on markets | www.daytondailynews.com. Apple said its fiscal fourth-quarter profit jumped 24 percent, largely because of a surge in sales of the iPhone, a product that now accounts for nearly half of the company’s sales. via Apple Profit Rises 24% on iPhone 5 Sales – NYTimes.com. The only problems that Apple is having is it can’t make it’s iPhone 5’s fast enough and that it just revamped it’s entire line which now costs a bit more to build. Hardly a loss. Somehow, speculators expectations of reported earnings are now more important than the facts. Speculators were expecting even higher profits from Apple and this somehow took the place of the real world results of the worlds most valuable company. Is it news? Or just Cox PR? 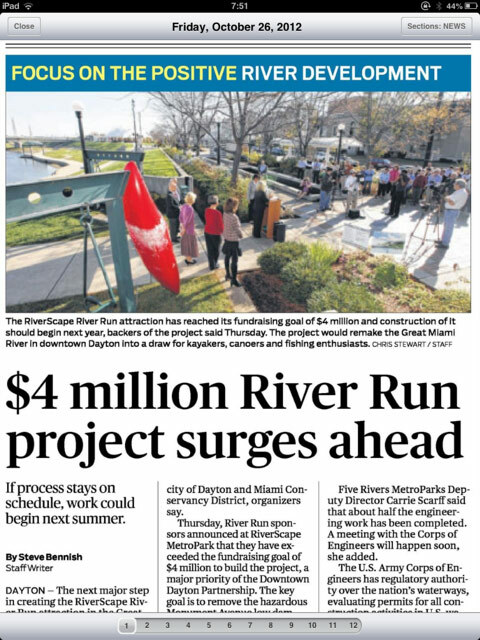 It’s this kind of reporting, where donations seem to count more as an indicator of a politicians performance on election day compared to polls and polls are more important than actual positions on issues. We’ve become so used to made up news that the actual news is currently dominated by speculation and opinion being passed off as news. Real journalism in Dayton is something we do a few times a week, when handed a story by people so fed up with the pervasive cult of corruption and they risk their jobs and civic standing by speaking out. Then the paper takes the credit. 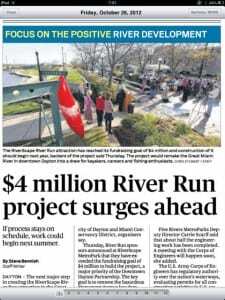 Or, as we had today, on the front page center, we have the “story” about the reaching of the $4 million goal to eliminate the low damns for paddle boats in the river with the header “FOCUS ON THE POSITIVE RIVER DEVELOPMENT” as if they get brownie points for covering their own donation of $1 million to make this happen. Real news isn’t supposed to be speculation, or positive or negative, it’s supposed to be impartial and factual, informative and inquisitive, smart and succinct, and yet, we have a story that says Apple reported losses- which is so far from true you have to wonder what drugs they are on in the Dayton Daily news office. To be the newspaper of record in a community is a huge responsibility- and the first one is to be trusted to get it right. What else did they screw up today? I had a couple of laughs with the Friday DDN’s article,’ Vore Outraising Dodge 3-1 in County Commission Race”. Obviously Rose Stuart should have been reported as Stuart Rose. @Bobby- I saw that too- and Stuart Rose doesn’t live on Needmore- that’s his offices. Was it a donation from him or his business? And- it amazes me how many people don’t know about the two tier tax system at Austin Road.